Eductors Using Liquid in Handling Dry Solids use liquid under pressure which issues through a nozzle in the eductor and produces a high velocity jet. This creates a suction in the body of the eductor and causes the suction material to be drawn into the eductor and entrained by liquid. Both the motive liquid and the entrained material are intimately mixed in the throat of the eductor and are discharged against back pressure. Fig. 267 Eductors Using Liquid in Handling Dry Solids, known as Hopper Eductors are designed as an economical way to mix dry product with a liquid stream. The unit consists of a body, nozzle, and a hopper. All threaded components of the same size are interchangeable regardless of the material. Four support brackets are provided and any workable material can be supplied on special order. Originally developed to mix drilling mud or oil industry applications, these devices are proven to be so effective and versatile that they are being applied in increasing numbers to diverse industries including the food, chemical processing, pharmaceutical, glass, power, and others. Fig. 254 Eductors Using Liquid in Handling Dry Solids for handling liquid solids, also known as Hopper Eductors are designed to obtain efficient liquid to solids entrainment ratios and maximum discharge pressure capabilities. The Fig. 254 Hopper Type Eductor is made for handling slurries or dry solids in granular form and are used extensively for ejecting sludges from tank bottoms, for pumping sand from filter beds and for washing and conveying granular materials. Agitating jet washdown nozzles keep the material from adhering to the sides of the hopper and keep it moving down into the eductor. Pressure water, passing through the eductor nozzle, entrains the sand, sludge, or other materials and discharges into the piping system. Standard Fig. 254 Eductors are made in cast iron and have hardened steel nozzles and throat bushings. Special materials are also available on order. The nozzle and throat are both easily replaced. Fig. 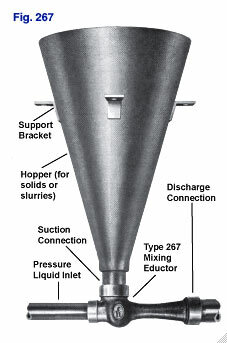 227 Eductors Using Liquid in Handling Dry Solids, also known as Inline Solids Mixing Eductors, are designed with an inline suction connection allowing for easy installation when the mixture is discharged directly into the top of a vessel. Furnished with a stainless steel funnel, the eductor can be made of any machinable material. Eductors Using Liquid in Handling Dry Solids both mix and pump solids using no moving parts and only a pressure liquid for motivating power. They are easily made from any machinable or castable materials and require little or no maintenance. Conveying granular solids dropped from a storage hopper into a vibrating feeder. Entrainment of dry powder that is difficult to “wet”. For more detailed information about Eductors Using Liquid in Handling Dry Solids, Bulletin 2SH-LQ Literature. To submit a Request for Quote (RFQ) for Eductors Using Liquid in Handling Dry Solids, Adobe PDF or submit an online interactive RFQ Form for Eductors Using Liquid in Handling Dry Solids. Fig. 254 Eductor Using Liquid in Handling Dry Solids in Application Conveying Granular Solids Dropped From a Storage Hopper Into a Vibrating Feeder. In this installation, granular solids drop from a storage hopper into a vibrating feeder which feeds the solids into the eductor hopper at a controlled rate. Water, bypassed from the pressure line, flows through nozzles located in the hopper and washes the solids into the eductor. There they are entrained by the jet action of the pressure water and are discharged. Although the material can be placed in the hopper manually, this system reduces handling and controls the flow of solids.